February is the month of love, and the Island Batik Ambassadors are celebrating with a Mini Love challenge! 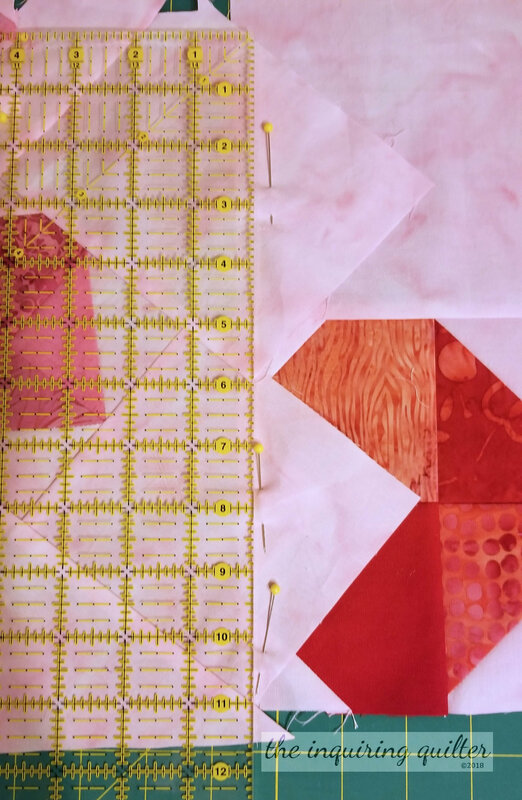 The challenge was to make a mini quilt celebrating love, using a special Valentine's/Galentine's fabric bundle Island Batik including in my recent box. 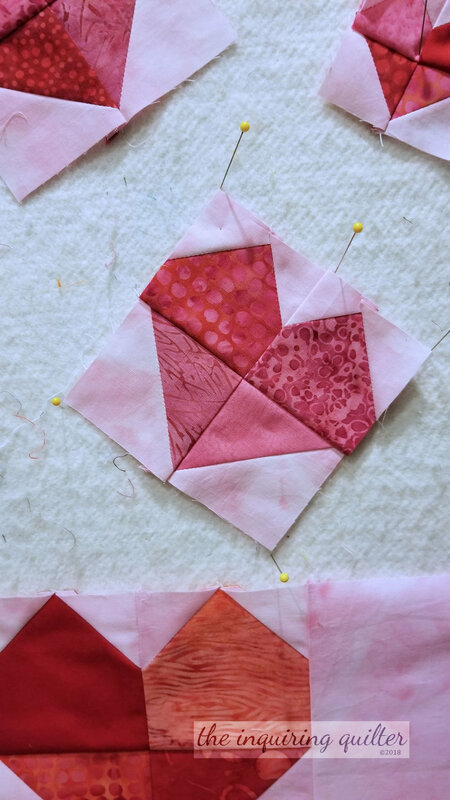 I combined the ones they sent with the Valentine's fabrics I received last year and a few I pulled from Stash Builder rolls to make a large selection of pinks and reds with which I could work. Here are the fabrics I used in my mini quilt. For this mini, I started with the name I had in mind for it: "Hearts a Flutter". Immediately, I thought of hearts fluttering in the air. But could I achieve it? I made the hearts first, in three sizes. Then I laid them out on my design wall as I saw them in my mind. To stitch them together, I added the background fabric to one heart, overlapped the fabrics then cut and stitched. Here's a close up of the cutting action. I would pin the two pieces so they would stay in alignment and then carry them carefully to my cutting board. I would then align my ruler where I wanted to cut, then slip the piece on the right out of the way and make my cut. If needed, I'd repeat this process to trim the piece on the right at the same angle. Then I'd sew the two pieces together. I continued this process, connecting one heart at a time until the lower half was done. Then I sewed the two halves together. Next, it was time to consider the quilting. 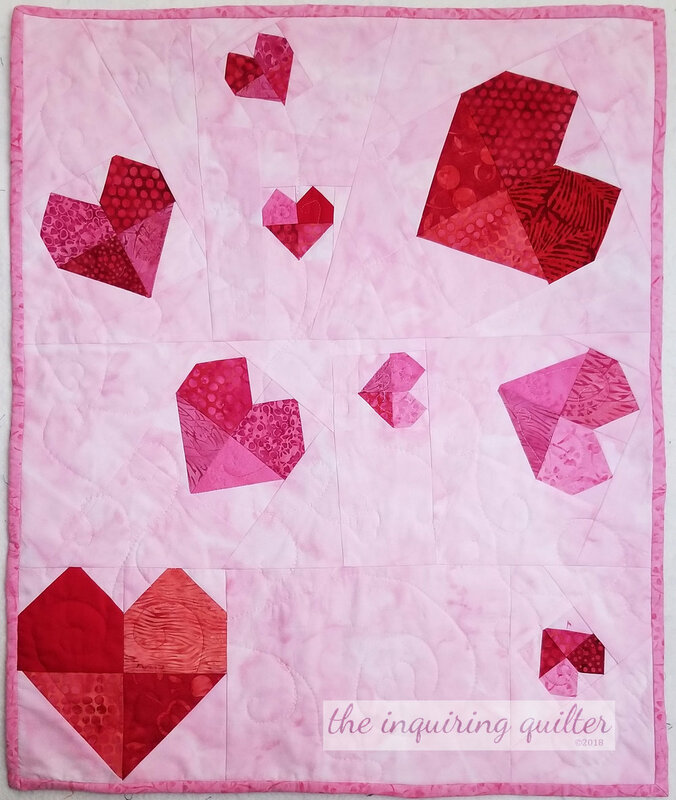 When I came up with the idea of hearts fluttering in the air, I thought immediately of swirly, curly quilting lines that would join the hearts in a flight path. I added tiny hearts at the end of some of the curls for a touch of whimsy. Disclosure: The products featured in Love Entwined were provided to me free of charge by Island Batik. tell me..have you ever made a quilt to celebrate a special event?